Melt -Embossing ~ A New Technique for Me! So I stamped with my White Craft stamp-pad, then tipped a healthy amount of white embossing powder on there (oh of course used my embossing buddy first) and then proceeded to emboss um…melt with my Heat Tool! I also really love how the embossing is a little hit and miss and transparent in some places. I’ve secured my window sheet onto the DSP with brads to avoid yucky adhesive marks. Doesn’t this flower from Autumn Flair look fab used in repeat like this? I thought I’d chuck some dry embossing in there too on my Kiwi Kiss Strip. 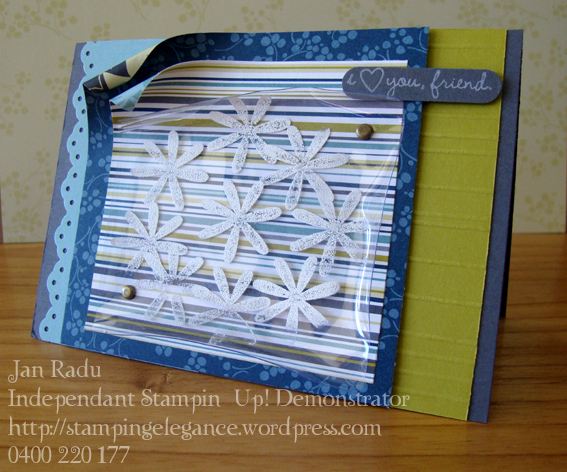 To do this I’ve used an embossing tool to score lines at various points along the card stock. My little sentiment (from Picture This Hostess set) is stamped using White Craft on Basic Grey Cardstock and of course punched with a word window. Stay tuned for more embossing um…melting to come – I don’t think I will put my heat tool away just yet! Remember if you haven’t already – head over to JAI and check out the fab DT projects on offer for your inspiration this week! Well, the discovery of penicillin was an ‘accident’. Your card won’t change the world but it brought a smile to my face. I love how ‘mistakes’ can turn out so cool! Wow what a discovery, I love the way it turned out. *SHOW OFF! * 😉 This looks cool.